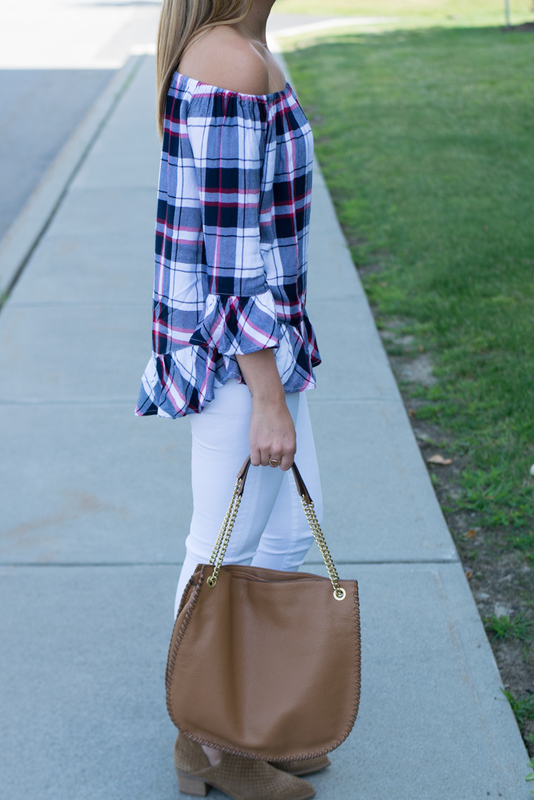 I'm so excited to be sharing this outfit today because this top is PERFECT for transitioning from summer to fall. It's super soft and warm but also off the shoulder so you won't get too hot. 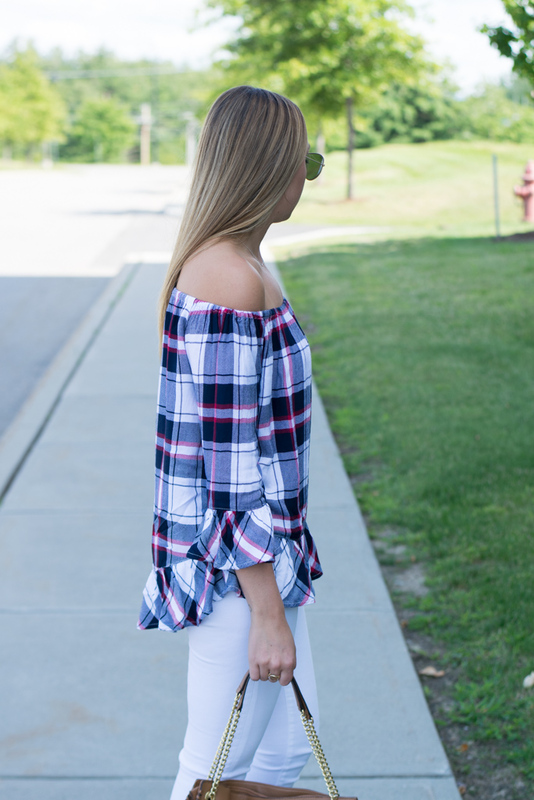 I love the ruffle details on the sleeve and hem as well as how it's a little longer in the back, this means you could wear this top with some leggings! I paired it today with white denim as it keeps it from looking too bulky for the season. 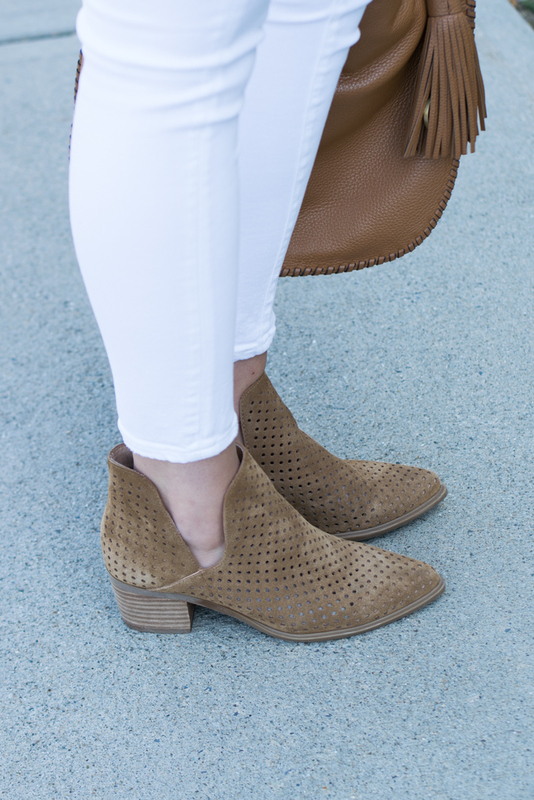 To finish off the look I wore my new perforated Steve Madden booties, I linked a similar pair because I couldn't find a site that had a full stock of the ones I'm wearing. The style is called 'Danese Perforated Suede Bootie'. We've been having some cooler temps in the 60's here so this outfit was perfect for the weekend! I hope the warmer temps stick around a little while longer but we will have to wait & see! I'm the worst at figuring out 'transition' outfits! The first hint of chill in the air and I drag out my furs haha! 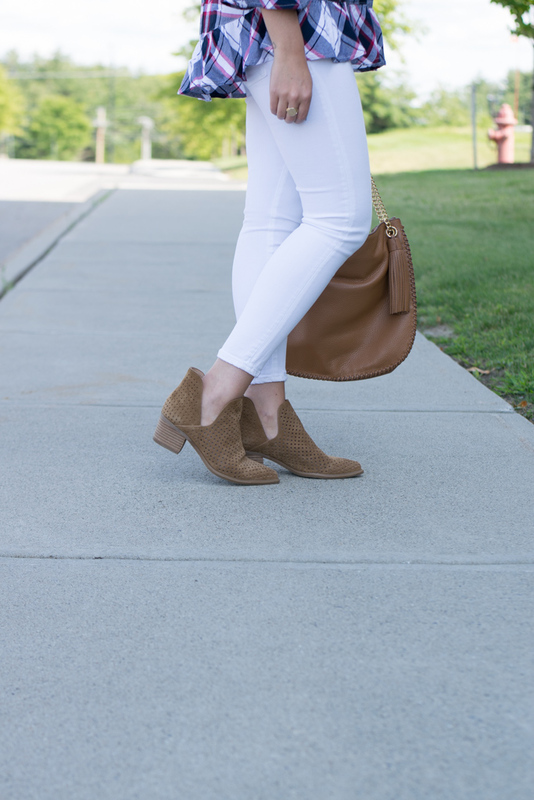 Totally in LOVE with those booties and the colors on your top! You look great! 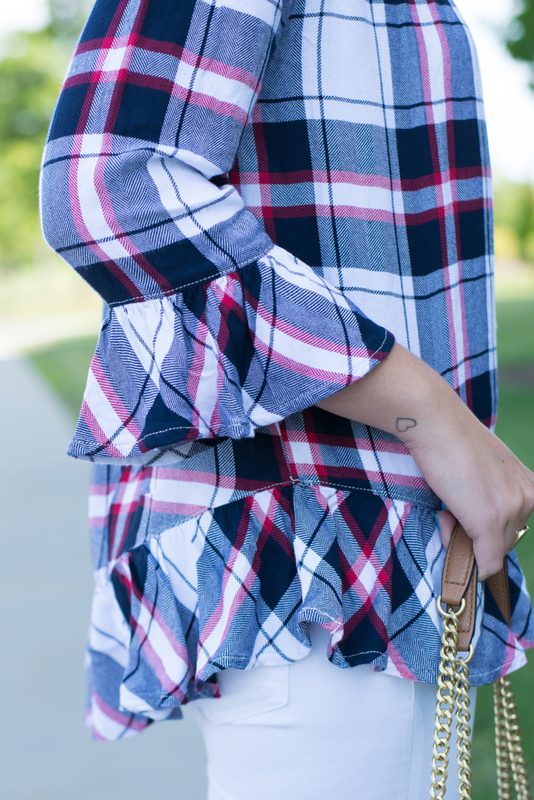 The off the shoulder/plaid combo is so cute! It's great for all the warm fall days ahead! That top is so cute and I love those booties as well! Love the top and those booties! I've seen so much off the shoulder plaid recently and I am loving every bit!!! I love this print and the fact that it's long enough for a dress with simple leggings. You can dress it up or down 😍 Love it! What a cute fall transition outfit girl!! I am also hoping the warmer temps stick around but not looking likely hahaha!! Love that plaid pattern and the ruffle hemline is just too cute. Such a great transition look! I love the plaid! Love that top! It's awesome for a great transition outfit. 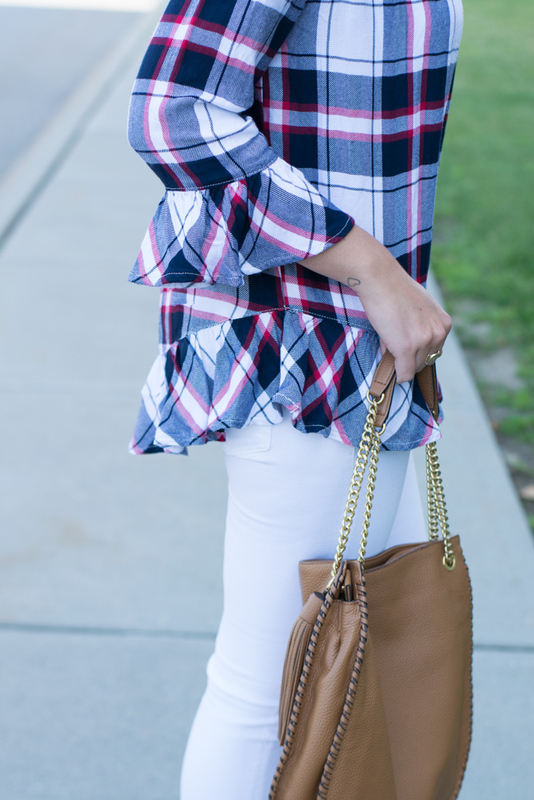 I love the frill detail on this plaid shirt! Very pretty! Omg love that top! Such a perfect transitional piece.